February 4th marks the 70th anniversary of the Battle of Makassar Strait, in which an Allied surface fleet was attacked by a large formation of Japanese bombers. Although the battle itself was brief and the casualties on both sides were minor, Makassar Strait did have strategic consequences. The battle came about because of Japanese landings on the Dutch colony of Borneo in January 1942. Although the Japanese had already occupied most of the island, Allied resistance was strong enough to force Japan to land reinforcements. A reconnaissance plane spotted the Japanese reinforcing task force on 1 February, so an ad hoc Allied flotilla was hastily dispatched to intercept the Japanese ships before they reached Borneo. The Allied force was part of the ADBA fleet, which was the combined might of the American, British, Dutch and Australian navies present in Southeast Asia when the war began in the Pacific. The task force dispatched to Borneo on 3 February was composed of the Dutch cruisers De Ruyter and Tromp, along with the US cruisers Houston and Marblehead. Escorting the cruisers were the Dutch destroyers Banckert, Piet Hein and Van Ghent and the American destroyers Barker, Bulmer, Edwards and Stewart. Although the ABDA task force was powerful, it was crippled by a lack of air cover. Thus, on the morning of 4 February, the force came under attack by as many as sixty Japanese land-based bombers. The Allied fleet scattered and avoided most of the bombs, but the USS Marblehead was hit twice and lost control of her rudders for a time. The USS Houston also took a serious hit aft, which knocked out one of her 8” turrets and killed forty-eight men. USS Marblehead in port showing damage to her stern caused by Japanese bombs on 4 February 1942. Realizing that continuing towards Borneo would mean repeated Japanese air attacks, Dutch Rear Admiral Karel Doorman ordered his task force back to port. With that order, the Allies ceded Borneo and its vast oil resources to Japan. 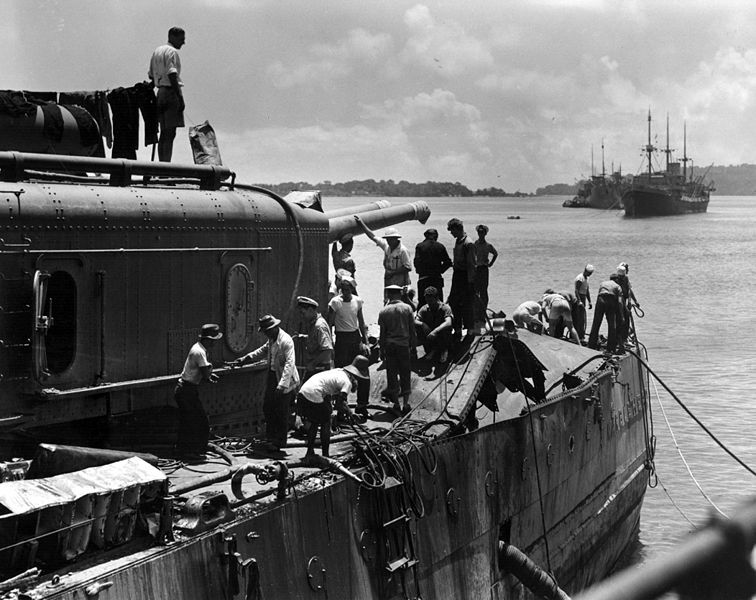 The Battle of Makassar Strait also marked the beginning of the end of the ABDA fleet. Increasing Japanese pressure in Southeast Asia would soon force the abandonment of most of the ports used by the Allied navies, which were soon forced to scatter. Of the ships engaged on February 4th, the De Ruyter¸ Van Ghent and Houston were all sunk within a month, and the Stewart was captured by the Japanese after being scuttled in port.